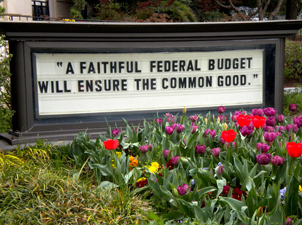 Blog: Is There Reality in Funding the Federal Government? Funding for the current fiscal year ends on April 28. Congress needs to complete plans for funding the federal government for this current fiscal year and at the same time begin to create a budget for 2018. Since Congress is on recess for four weeks before the April 28 deadline, there are only five weeks to get the job done. Decisions on appropriations will impact a number of NETWORK “Mend the Gap” priorities, but three programs are particularly vulnerable: housing support for those in poverty, healthcare funding and funds to conduct the 2020 Census. Housing vouchers are particularly at risk for this year. The current budget allotted $500 million less than the amount needed to fund currently held vouchers for the rest of the year. CBPP estimates that more than 100,000 vouchers could be lost in the next few months. 100,000 households could become homeless unless we can secure new funding. The Affordable Care Act continues to be under attack. One of the key ways opponents may move to cut the program is to defund its operating system. House appropriators, for several years have denied the Center for Medicare and Medicaid Services and the IRS new funding to cover the administrative costs of ACA implementation. These funds and more are at serious risk. Past decennial censuses have tended to undercount communities of color, people experiencing poverty, immigrants, young children, Native Americans and rural residents. The systematic undercounting of these communities decreases their access to federal funding and proportional representation. If the Census Bureau does not receive increased funding to conduct necessary tests and prepare for 2020, we fear that these gaps in the census will persist. This year, the funding decisions are particularly daunting, as the administration and many House Republicans are determined to increase military spending while adhering to the top level spending caps established in the Budget Control Act, 2011. Doing this necessitates cuts in non-defense spending – mostly human needs programs – in order to not exceed the caps. Further, at the Trump Administration request, Congress is considering a 2017 Supplemental Budget. They propose that it would cover the added cost of the President’s “deportation force,” which we have seen escalate its activities in the last week. It would include some war costs, but mostly would cover the cost of President Trump’s Border Wall which ranges from estimates $8 billion to $21 billion. Removing this from the FY 2017 appropriations does not relieve all of us from paying for it. We would still need to fund the Supplemental through our tax dollars. NETWORK will actively work to stop this bill. In addition to completing work on the FY 2017 Appropriations, Congress faces passage of a Budget for FY 2018 – which goes into effect October 1, 2017. They have yet to receive direction from the President, other than broad statements of cutting non-defense spending by a stunning $3.7 trillion over ten years. This equates to a 43 percent drop in meeting the basic support of people with limited income. Increases in military spending and unwillingness of Congress to increase revenue put the burden of balancing the budget on the backs of people in need by reducing spending on human needs such as housing, healthcare and the census. This is in direct opposition to what NETWORK Lobby and Advocates for Catholic Social Justice continue to work to achieve. It is imperative that all of us engage with our members of Congress frequently to influence their spending decisions. We need to work hard to protect the dignity of all people in our communities. This entry was posted in Budget, Front Page, Policy Update, Sister Spirit on March 13, 2017 by networklobby.